The trial date in the defamation case against rocker Courtney Love over controversial social media postings has been postponed until February 8. Fashion designer Dawn Simorangkir, known as the "Boudoir Queen" for her lingerie-inspired garments, is suing the troubled rocker and actress over a series of 2009 tweets and other online postings. The case was filed last year in Los Angeles County Superior Court. 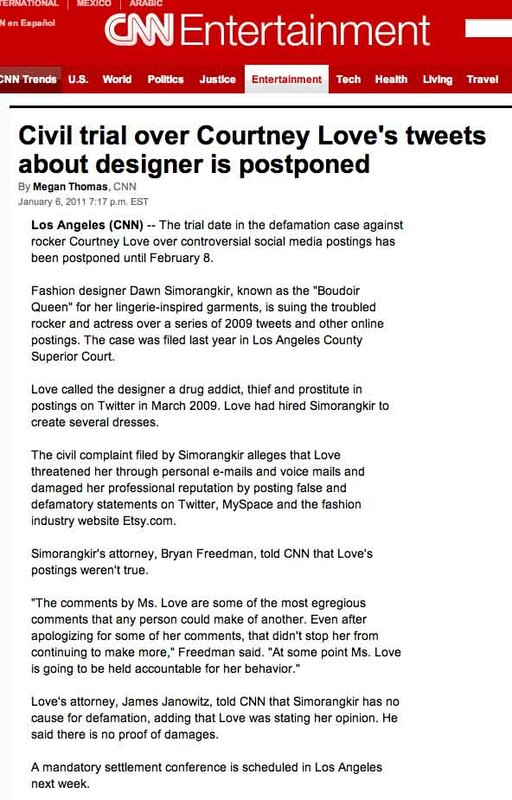 Love called the designer a drug addict, thief and prostitute in postings on Twitter in March 2009. Love had hired Simorangkir to create several dresses. The civil complaint filed by Simorangkir alleges that Love threatened her through personal e-mails and voice mails and damaged her professional reputation by posting false and defamatory statements on Twitter, MySpace and the fashion industry website Etsy.com. Simorangkir's attorney, Bryan Freedman, told CNN that Love's postings weren't true. "The comments by Ms. Love are some of the most egregious comments that any person could make of another. Even after apologizing for some of her comments, that didn't stop her from continuing to make more," Freedman said. "At some point Ms. Love is going to be held accountable for her behavior." Love's attorney, James Janowitz, told CNN that Simorangkir has no cause for defamation, adding that Love was stating her opinion. He said there is no proof of damages. A mandatory settlement conference is scheduled in Los Angeles next week.